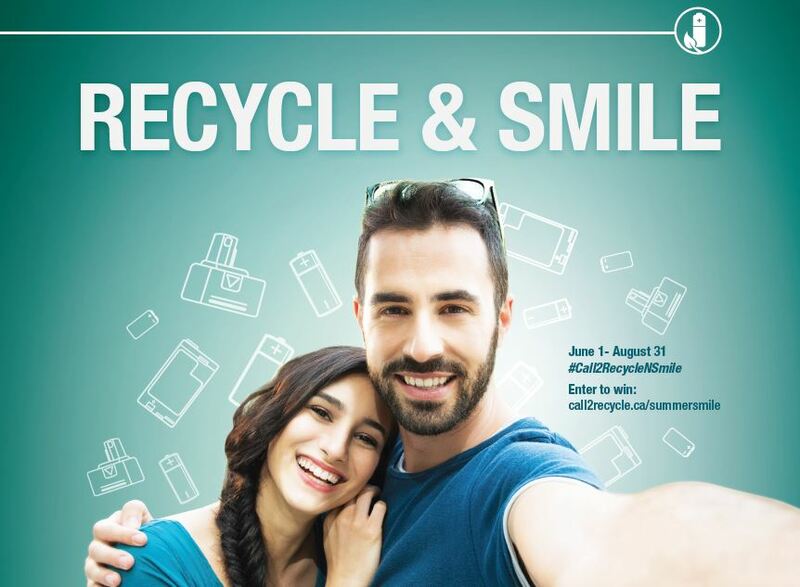 This summer, the Call2Recycle Canada team ran a unique consumer contest, inviting Canadians across the country to jump on-board the battery recycling train with summer recycling selfies! To participate, consumers were asked to gather their used household batteries under 5kg, find a nearby drop-off location using the Call2Recycle locator and capture their best battery recycling selfie. Participants were able to enter the contest on www.call2recycle.ca, or via Twitter and Facebook using #Call2RecycleNSmile. As an added bonus, consumers who recycled their batteries at a Staples Canada store were entered also had a chance to win a Staples gift card. To augment the consumer contest, Call2Recycle Canada partnered with two, top-tier Canadian bloggers – British Columbia Mom and Modern Mama. Both bloggers published stories detailing their families’ battery recycling experience while encouraging their followers to join the contest and educating them on the importance of battery recycling in general. Their content generated fantastic engagement both on their websites and via social media, and the partnership generated 155,427 impressions. With the help of our many partners and engaged consumers, the contest was a great success! The Call2Recycle team received more than 20 entries from multiple provinces. The ten lucky Canadian winners included: Emily Schwartz, Brett Paskaruk, Heather Stanik, Leonardo Faundez, Galina Sanaeva, S. Kathryn Leitch, Nikki Best, Tabitha Cameron, Maiss Kaber and Nicole Guthrie. In addition to this, four elementary schools from Carleton Place, Ontario conducted an inter-school battery recycling competition in conjunction with our ‘Summer Smile’ contest. These amazing kids were able to collect a grand total of 1,429.9kg used batteries! Congratulations to all the winners and thank you to everyone who participated. With this fun contest we were able to help keep even more batteries out of landfills. Turn Back Your clocks, Turn in Your Batteries!